The Battle of Paris continues, with the French security forces attacking and killing people claimed to be part of the “sophisticated conspiracy” resulting in the Friday the 13th attacks. Paul Roberts raises some MOST interesting questions, but the key one is (assuming the “suicide attackers” really blew themselves up) WHY they would do so? Because they are true believers. As I’ve pointed out before, it doesn’t matter if the Caliphate is a tool of the West or the Illuminati or some Vegas Mafia don: they are willing to kill and be killed. Their religion is false, but they clearly believe it: they are willing to die with the promise of paradise and whatever they are to get. THEY think that they are serving the cause of Allah, no matter whether the people that tell them that believe what they are preaching or not. We can see the same thing in the Crusades: the popes and cardinals and abbots who preached salvation for those that rode and sailed east to liberate the Holy Land may not have believed what they preached, but those who rode and sailed for the most part DID (or were there to prey on the true believers and avoided nasty things like sieges and frontal assaults as much as they could). Paul Roberts also asks another very interesting question. WHERE are all the videos? Where are all the still photographs? I have spent some time searching various search engines searching for “Paris Attack” and “ISIL Attacks” and “Paris Suicide Bombers” and the like, and I’ve found LOTS of pictures of “soldiers” (usually in black with masks – see yesterday’s commentary), lots of flowers and candles (so many still practicing Roman Catholics in Paris? Who knew? ), lots of scenes of traffic and mobs, and a few of carefully covered bodies: the white shrouds always pristine. But these were venues filled with people – modern people always taking selfies and sending Tweets and updating Facebook and videoing everything. 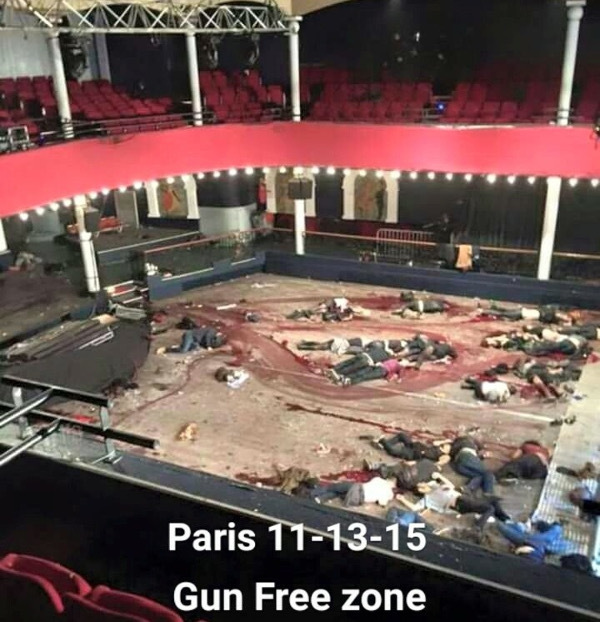 So why not even pictures of blood-soaked seating and aisles? Why no pictures of gunmen hosing down their vicinity? Why no pictures of dead and wounded bodies thrown back by automatic weapons fire? Why so VERY few photos of bandaged victims on gurneys and in wheel chairs? We’ve seen these in Boston, seen them where the Caliphate has executed and massacred and beheaded thousands. We’ve even seen the gory remains of airliner crew and passengers scattered over the ground. We see dozens of photos of dead “Palestinian” victims of Israel, especially of children, but of adults as well on operating tables and in the remains of bombed-out buildings and protest sites. We can find hundreds of images of Beslan victims, dead, dying, and wounded. But I can’t even find a single picture of a victim of Friday the 13th with a flesh wound or blood on their face. What is going on? Are the French police so efficient that they have scooped up every cell phone, every camera? Are the media so effective at censorship that every image is blocked? And no one has complained? One of these venues was a ball game; another was a rock concert: both places where the flashes can blind you if you are looking the wrong way. They were filled with thousands of people – but NO pictures? I don’t think we are going to get any answers to these questions, at least not here on Earth. But even a FEW answers might cause massive upheavals in world affairs as we know them. And help in the fight for liberty. Mama’s Note: Very interesting indeed. This was the only account I could find today, though I saw a great many pictures of the dead and injured on Friday and over the weekend. The whole story seems to have vanished, with only the politicians arguing about what to do. I did find one picture that was posted at a blog on the weekend. WARNING: Graphic photo of the dead, and I think I can see one person standing at the side who appears to be pointing a rifle. This entry was posted in Commentary on the News, Nathan's Rants and tagged France, Islamic wars, Local tyranny, Paris, questions, Stupid cops, Templars. Bookmark the permalink.